LILLIAN DELEVORYAS is a Greek-American artist who made her life in England from 1970. She collaborated with Kaffe Fassett in the 70s, forming the Weatherall Tapestry Studios in the Forest of Dean, as well as designing several fabric collections for Designers Guild in the 80s. 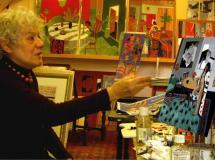 Her work has been exhibited widely on both sides of the Atlantic, including the Robert Schoelkopf Gallery in New York, the Hellenic Centre and Long & Ryle in London. Lillian's work is now managed by Collection Boreas, a not-for-profit company dedicated to promoting her artistic legacy. Please contact us for sales of high quality art prints of her work and information about forthcoming exhibitions.